A new piece of gym equipment for people with physical disabilities is currently in the top running for the U.K.’s James Dyson Award, a prestigious design award. 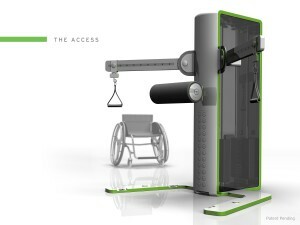 The Access is universal fitness equipment that accommodates those with various disabilities and able-bodied users alike. Comprised of a central tower with two arms extending laterally, each arm rotates 180 degrees independently and can be configured for a user’s unique needs. The James Dyson Award is open to product design, industrial design and engineering university level students. You can vote for the 2009 winner here. Its excellent information for us, your blog is very motivating. I am very impressed with your information that this posts about good knowledge. When I was reading it, I am totally agreed with your thought, Thanks for sharing. Wheelchair exercise and fitness program can improve your overall health, boost your immune system, and get blood flowing to the brain preventing brain diseases such as dementia and Alzheimer’s and increase mobility for you. I would say that the future technology always serve better and more than better to disabilities.